Hello, everyone I was wondering if there are any good book or article that go over the different methods for attaching a typical enclosed car composite body to a tube frame. I know some of the most common methods are the ones typically used in dragster where the epoxy weld plates to the body and weld tubes from that to the body or just rivet the body on to tubes attached to the tube frame but I am curious to see other methods my apologies if it seems like a stupid question. I pretty much asked the same question here a couple of months ago. Lots of helpful guidelines (ie, make sure the 'glass is thick at the mounting point" but beyond that, no secure things. Plates on both sides of the 'glass riveted together looks like a secure idea... just ugly. I have some fiberglass/foam composite panels and some aluminum pieces. On either one, I have used "sidewalk bolts" and "clip nuts" to attach them. There's also "Terry Spring" latches which are popular with the sports-racer crowd. I don't have a picture, but you can google 'em up for a look-see. Seems like I got mine from Pegasus. Again, not invisible, but they're easy to open/close and rather small. And that's my .02... For you, No Charge! The idea is very low clamping pressure spread over a large, supported area. Bonding direct makes future repair from accident damage a hassle to where you might want to start over instead. If you have no flanges, bonding to an intermediate flange that will bolt to the chassis would work well. Doubled, “jamb” nuts are better than self locking nuts in that they hold better, don’t wear out, and cost much less but the bolt must be longer for two nuts. You can use half height nuts for jambing to save weight and space. If using rivets on glass, they should be 1/8 or thinner shank, have rivet washers under the head and have an aluminum stem for lighter clamping. Bodies are usually supported the full length of the rockers with deep glass ribbing/bulkheads or steel firewalls/bulkheads rising to meet the glass. Sorry for not explaining better what I am trying to do. I have an old fiberglass mini body that I am currently building a tube frame for and I am trying to come up with a way to mount it to the chassis without it being noticed like to look as close to a steel normal mini as possible. The author bought one of a set of "Super Cars" built for an advertising campaign by a British commercial bank. It looked really good at 20 feet... but everything below the paint was a cobbled-up disaster. He wound up doing pretty much everything - mounting the body securely to the chassis, panel alignment, cutting and finishing hatches for access to minor bits like the engine and master cylinder, legal lights, window recesses and gaskets, doors with proper hinges, jambs, latches, and weatherstripping, wheel wells, wiper mechanism... all the not-fun bits that get glossed over. Bear in mind the car had done its photo shoots and was technically driveable when he bought it; all the subsequent work was to bring it up to the level of sophistication of, say, a 1984 Yugo, as opposed to "sleazy 1970s VW body kit." 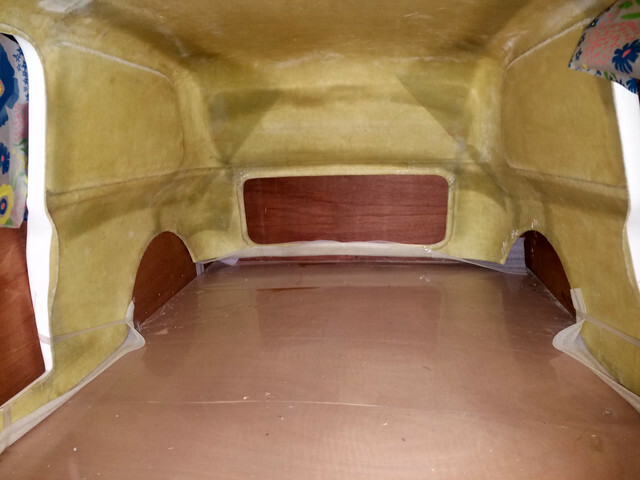 post some pics of the inside of the body and we can provide some ideas on mounting and support. Sorry I missed your post. If you are willing to do some fiberglass work, I suggest urethane foam ribs with 3 layers of heavy weave, then drill and fit rubber well nuts or riv nuts along the inside face. Bolt steel strip to these nuts, then build your chassis out to these strips and tack weld them on tot he chassis, remove the body, then final weld. You can find urethane foam to make ribs from at a home improvement store (insulating sheathing with an aluminum face) in various thicknesses and use polyester resin. If you do not want to do any glass work, steel tube with rivets on the outside will work. Soft pull rivets, washers, and lots of rivets to spread the load. There are special high density epoxy boards you could glass into the body for hard points. One type is called G10 board. You can buy premade ribs to fit. Composites and monocoque structure are huge subjects so be specific as possible when asking questions.